As our wee Cessna soared a dizzy height over the Peruvian desert, just a couple of hundred miles southeast of Lima, the dull pale sameness of the rocks and sand organised and changed form. Distinct white lines gradually evolved from tan and rust-red. Strips of white crisscrossed a desert so dry that it rains less than an inch every year. Banking equally hard to the right and then left, the landscape transformed as lines took shape in simple geometric designs: trapezoids, linear lines, rectangles, triangles and whirls. Some perfectly straight, many running parallel and others intersecting, creating a grand geometric profile spanning a 37-mile long plain sat between the Inca and Nasca Valleys. 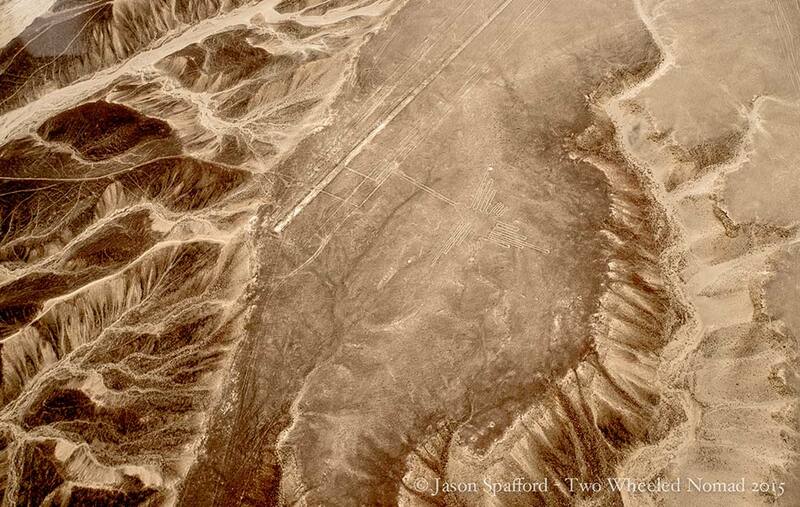 These are the renowned Nasca lines—subject of mystery for over 80 years. So how were they formed? What purpose did they serve? Was extra terrestrial life involved? Against a background of cloudy cerulean sky, some of the swirls and zigzags started to develop into an assortment of distinct shapes: a hummingbird, a condor, a whale and a 1,000-foot long pelican. 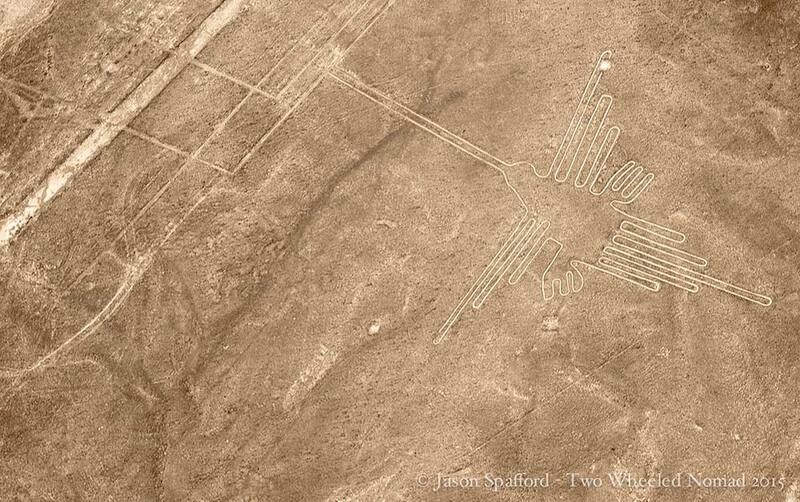 Amongst other beasts and engravings etched on a giant scale, which can really only be appreciated from the sky. The viewing towers do little to ascertain a strong vantage but give an inkling of perspective. 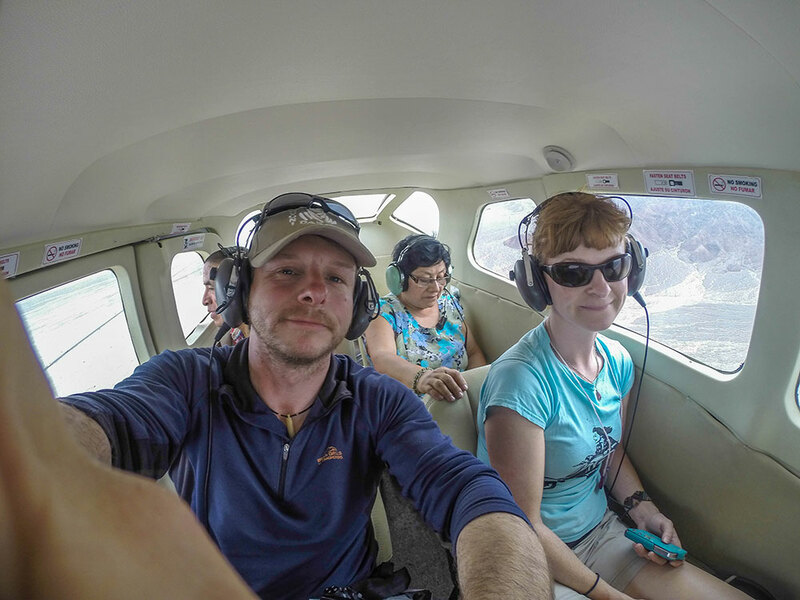 Even if I did spend the 30-minute flight in our cigar shaped tube on the cusp of bringing up breakfast, while Jason battled furiously with his irrational fear of flying. Amusingly opposite experiences; I couldn’t have cared less about dropping out of the sky in fear of chundering over four unsuspecting passengers whereas Jason’s stomach gave rise to only butterflies. Titillating his insides as we oscillated through a slightly fractious air space. 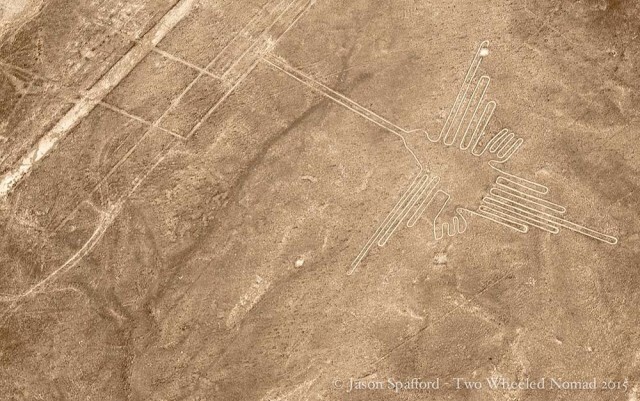 Incredibly, there are over an imperceptible 800 straight lines, 300 geometric figures and 70 animal and plant designs, which are called biomorphs. 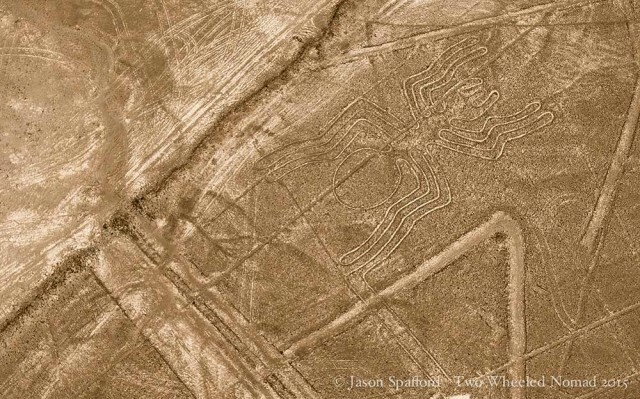 All curiously carved into the Peruvian desert by ancient Nasca people, so scientists have us believe, of whom flourished from around AD 1 to 700. Some of the neat streaks run up to 30 miles, while the biomorphs range up to 1,200 feet in length, as large as the Empire State Building. 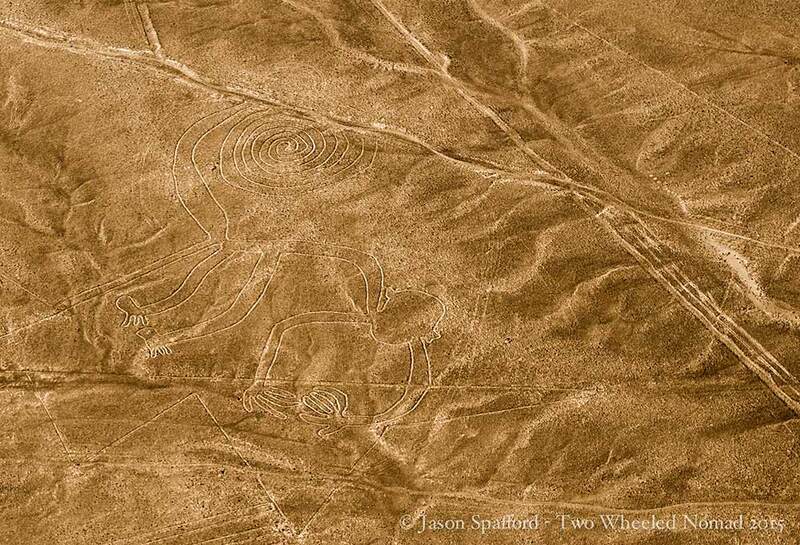 The lines are technically known as geoglyphs—drawings on the ground made by removing rocks and earth to create a ‘negative’ image. The rocks that cover the desert have oxidized and weathered to a deep rust color, and when the top 12-15 inches of rock is removed, a light colored high contrasting sand is exposed. Certain areas of the pampa look like a well-used chalk board, with lines overlapping other lines, and designs cut through with straight lines of both ancient and more modern origin. Because there’s so little rain, wind and erosion, the exposed designs have stayed largely intact for a couple of millenniums. Mmmn, so what we’re looking at is just 2,000 year old graffiti. 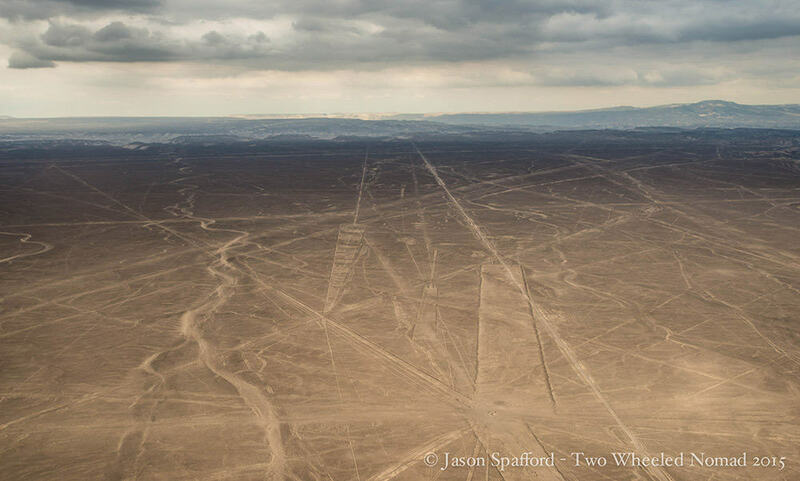 Discovered in the 1930s post the advent of the aeroplane, American professor Paul Kosok investigated the Nasca lines, looked up from his work to catch the sunset in direct alignment with a line and called the 310 square mile stretch of high desert “the largest astronomy book in the world”. 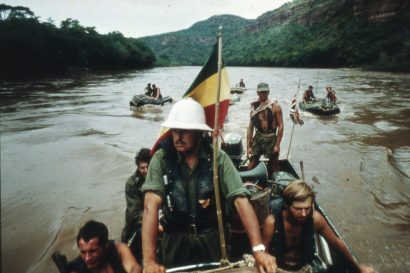 Johan Reinhard, a National Geographic Explorer-in-Residence, adopted a multidisciplinary approach to the analysis of the lines and urged folks to “Look at the large ecological system, what’s around Nasca, where were the Nasca people located.” In a region that receives only about 20 minutes of rain per year, water was clearly an important factor. “It seems likely that most of the lines did not point at anything on the geographical or celestial horizon, but rather led to places where rituals were performed to obtain water and fertility of crops”, Reinhard hypothesised. And you might also find merit in Anthony Aveni’s concurring theory, a former National Geographic grantee that the trapezoids are big wide spaces where people could come in and out. The rituals were likely involved with the ancient need to propitiate or pay a debt to the gods, probably to plead, pray and dance for water. After all, spiral designs and themes have been discovered at other ancient Peruvian sites. Animal symbolism is common throughout the Andes including those found in the biomorphs drawn upon the Nasca plain: spiders are believed to be a sign of rain, hummingbirds are associated with fertility, and monkeys are found in the Amazon—an area with an abundance of water. “No single evaluation proves a theory about the lines, but the combination of archaeology, ethno-history, and anthropology builds a solid case,” said Reinhard. Add new technological research to the mix, and there’s no doubt that the world’s understanding of the Nasca lines will continue to evolve. So even they and others with credibility in their field, including one woman, Maria Reiche who devoted 40 years in study of them, still have no conclusive evidence as to how and why the Nasca lines came into existence. The plain – interweaved by a network of these giant lines with many forming rectangles – has a striking resemblance to a modern airport. Perhaps they had been built for the convenience of ancient visitors from space to land their ships. As quirky as it might be to subscribe to this theory, the desert floor at Nasca is soft earth and loose stone, and wouldn’t support the landing wheels of an aircraft but mayhaps it would a hovering flying saucer. Regardless of which camp you may sit, to my mind, as fascinating as the figures and lines are, couldn’t have been made without somebody in the air to direct the operations. You simply can’t see anything from ground level! Who would go to that kind of effort without ever being able to see it? For now, an unanswered mystery that’ll have to remain up in the air. 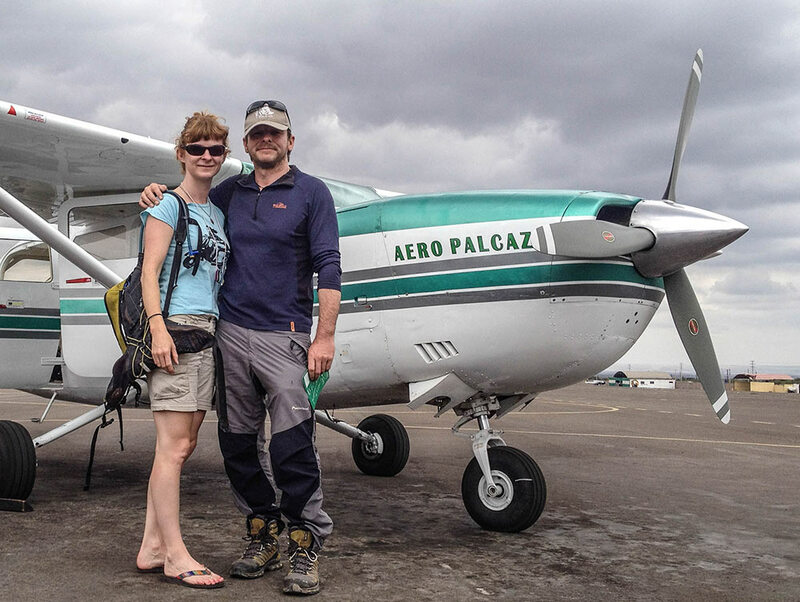 Still, touring the desert by air is a, if not thee best way, to hopscotch over Nasca’s relatively big distances and see the scale of these intriguing forces that shape the bleached and thirsting land. With our rear view mirrors flirting with the Freddy Flintstone hills of Puquio, we tootled towards our next stop: Huacachina, entertainingly pronounced ‘Whacka-cheena’. Built around a small natural lake in the desert, 185 miles south of Lima, it’s known as the ‘oasis of South America’. Legend holds that the lagoon was created when a beautiful native princess was apprehended at her bath by a young hunter. She fled, leaving the pool of water she’d been bathing in to become the lagoon. The folds of her mantle, streaming behind her as she ran, became the surrounding sand dunes. And the woman herself is rumoured to still live in the oasis as a mermaid. How whimsically unromantic. Why the detour? We fancied a spot of sanding around. And what better diversion to spend 40 Peruvian soles ($13 US) and immerse oneself in the warm, silky stuff than by taking a buggy ride on dunes that stretch up to 150 metres high. Transporting us deep into the desert, Manuel our driver (from Hostel Huacachina Sunset where we lodged), set us in store for a white-knuckle thrill ride and a half. Tension tightened around my chest like an eagle’s talons. We peaked at the summit of a giant dune. Having floored it all the way up, Manuel stopped abruptly cresting a dune, smiled placidly having long mastered the subtle skill of momentum. We had all somehow avoided a coronary arrest. A sudden silence hung above the buggy as passengers prepared for the stomach-churning descent. Around me stretched miles of golden dunes rolling in waves to every horizon, like a scene from Lawrence of Arabia. I was in the heart of a great sand sea. Before you know it, your stomach is left behind but by no means forgotten. My vision swims but I notice the synchronised sway of us all moving as one. Speed increases by the second, hairdryer wind tousling our hair as we accelerate down the dune in what felt like a vertical plunge. Waves of sand crest over the hood as we plow an avalanche that gains size and momentum, vibrating and growling, as we lick up speed. 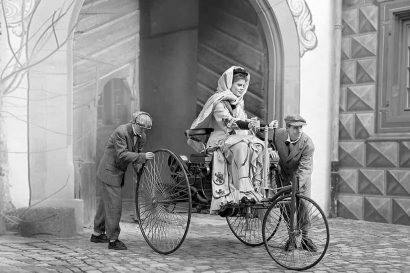 The wheels are adept at careening over the boisterous bumps, I however, am carted above like a ragdoll being swung in the arms of a six year old. Twisting, looping, corkscrewing—what feels barely in control—Manuel’s ingenuity is tested at every turn but tackles each manoeuvre with composure. As we wind a snaking course through the dunes, I glance at the terror flashes in everyones’ eyes and grin a nervous smile at Jason. Whooping with a tremor invading my voice, Jason winks encouragingly at me before his head jolts in keeping with the movement of the bouncing buggy. I begin to chuckle, quietly and apprehensively at first but after a couple of snorts, laughter simply starts tumbling out. There’s a backward logic to feeling ecstatic and uneasy at the same time. An occasion that is utterly thrilling to be so unreservedly terrified. We stop for the tenth time atop a skyscraper tall dune, aiming sharply down. I feel like a 20-pound trout on a five-pound test line. The sand buggies busying around below are the size of Tinker Toys. The downhill screams in unison make this the scariest rollercoaster I’m ever likely to ride. Including those that fly you through space at Gravity force 3, or necessitate 24-hour beacons to forewarn low flying aircraft. Excitement rushes through my body like raging rapids in a river. Head spinning, I climb out of my seat, legs akin to quivering jelly. I love and loathe the experience, my face having assumed dubious and dreadful expressions when in a state of self-induced terror. Manuel left us caked in sand, sweat and suncream from matted head to toe. We periodically stopped to sand-board increasingly steep dunes on our bellies, braving ourselves and daring each other to keep our feet lifted up so as not to brake and diminish speed when whizzing down. I’d skinned my knee but having capped, cornered, glided and skimmed over the dunes, flew over them air-borne at every given opportunity and teetered on tipping up—roll-cage ready to rock—my whole body wrung with having a complete hoot. We’d created our own nifty Nasca lines of incised swirls and punctuations in a thin veneer of sand, albeit none were quite so uniform or unique but they—like the ancient shapes and streaks—left us reeling in their wake just the same. With sand castles in my hair, ears, pants, up my nose and goodness knows where else, I became a human sand pit and felt like a four year old again who just didn’t care: intent on fiercely good fun. We were out on our desert tour for two and a half hours when we’d paid for only one. Insides churned up more than the sand, I’d bruised like a peach post the belly boarding but you can’t knock the value-added craic. Throughout the day, sand-boarders and hikers appeared on the slopes of the dunes, trudging up in staggered lines. Reaching the top, their toil gave way to pure pleasure. Only one appealing option stared blatantly back at me—running downhill with wild abandon, high kicking my way to the bottom in a ‘Zebedee’ sprung-loaded style, laughing hysterically, while others took their pleasure in sand boarding, rolling or slip-sliding, all in their own avalanches of apricot sand. 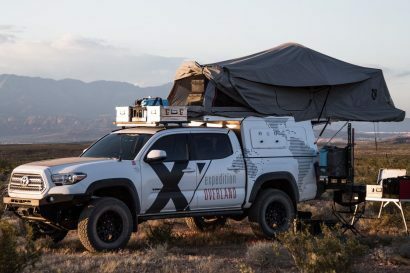 Deep inside the desert’s folds, it almost felt like uncharted wilderness whose expanse, for all practical purposes, became our personal desert. On our last evening, with every ounce of strength remaining, I forced my feet to plod forward as they shished on an upward sand ridge. I was scowling and didn’t know why. There wasn’t a single thought in my mind that might bring a scowl to my face just then. ‘Being royally unfit for the sandy footslog may’ve played a role’, I mused as my ragged breathing sawed the air. We stopped and settled on a lofty dune at dusk. And reached an astonishing view—in a tawny light, towering dunes pitched down to the oval oasis of Huacachina. It was an epic landscape with cinematic beauty. By dusk, most of the day-trippers had trundled away leaving footprints dimpled in the sand. It was then we were treated to the sunset of all time whose shafts of fiery orange and intensifying rays deepened over the dunes, so bright they hurt my eyes. We saw the final visitors climbing the ridgelines of the tallest dunes, tiny figures silhouetted against the disappearing russet red sun emblazing the landscape in such improbable colours, even Hollywood couldn’t make them up. There was no wind that night, no hordes of people, no sounds. Scooping up some sand, I let it trickle through my fingers while I studied the way the grains glimmered and hoped these sun-reddened dunes would dance in my dreams, beckoning me. 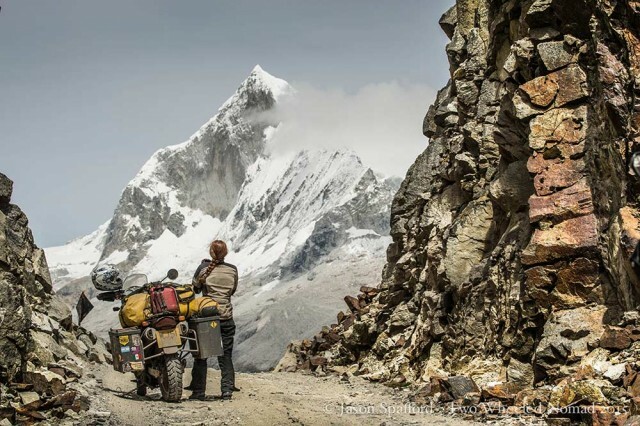 I rocked back and watched an ocean of ethereal sky turn velvet orange, peach and pink and the silver spray of the Milky Way appear, serene in my own private Peru.